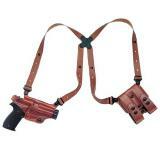 Shoulder holsters are the classic choice for television and movie detectives. 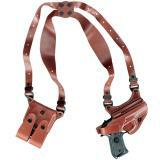 Dirty Harry used one to tote his .44 Magnum around. 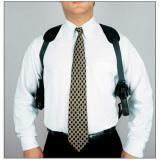 Away from the silver screen, they still offer unique features that make them a useful option for some officers. 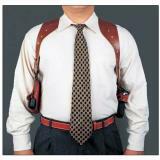 Its high position allows you to conceal them under a jacket and makes them far more comfortable for seated use than an inside-the-waistband or paddle holster, ideal for officers who spend a lot of time at a desk or in a vehicle. 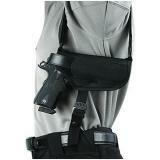 They also provide a concealed carry option for larger handguns that could not be easily accommodated inside the pants. 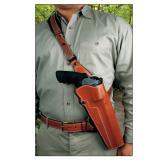 We carry shoulder holsters from some of the world's most popular manufacturers, including Galco, Safariland, Uncle Mike's, DeSantis and Bianchi. 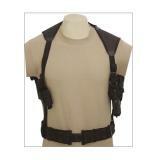 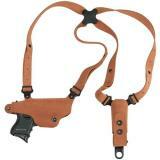 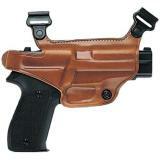 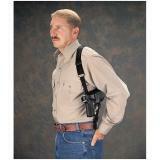 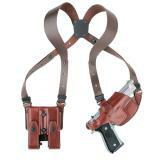 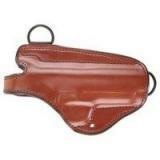 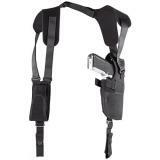 Shoulder holsters come in two main styles. 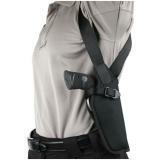 Single-sided designs use an elastic loop around both shoulders to support the weight of your firearm on the crossdraw side. 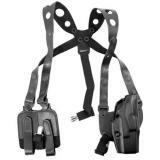 Double-sided designs are more common, and are constructed with a double shoulder harness that connects in the back. 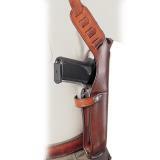 Depending on the particular model, the firearm can be carried horizontally or vertically. 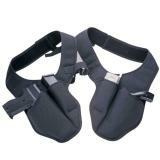 Some more advanced versions come with swivel backplate for enhanced comfort and mobility. 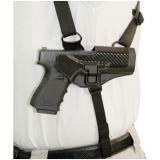 Double-sided harnesses often feature a magazine holder or other equipment pouch on the off-side, helping to balance the weight of the firearm for a more stable fit. 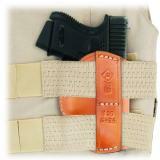 While they can be worn without a belt, many can also be clipped to the belt to prevent it from moving during wear. 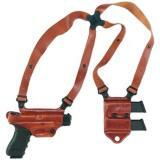 They are typically designed with adjustable straps for a custom fit. 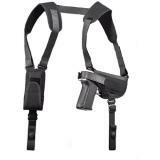 Shoulder holsters often feature retention systems to keep the firearm secured as you move, from quick-release thumb breaks to more advanced auto-locking devices like Blackhawk's SERPA or Safariland's Automatic Locking System. 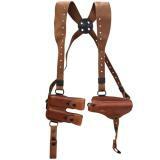 Classic shoulder holsters like Galco's Miami Classic are usually made from high quality leather, but many manufacturers also produce extremely durable nylon styles, often available at lower prices.